For nearly 15 years, Endofilter has provided top quality replacement filters for Automated Endoscope Reprocessors (AER), often referred to as scope washers. Most of the items we offer are proven in years of continuous usage. Others represent upgrades for premium performance. We meet or exceed the specifications of the filters we replace. All of our bacterial retentive membrane filters are manufactured in a Cleanroom, 100% integrity tested, and validated to HIMA, ASTM, and FDA requirements. On our site, you can find a listing of many of our standard products for several OEM’s. Our new location allows us to keep a substantial inventory of these items. 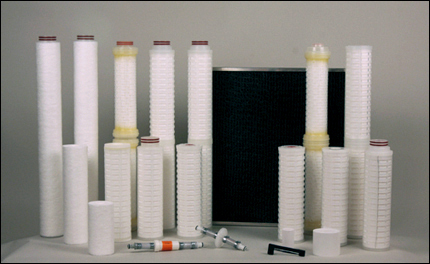 In addition, we offer longer versions of prefilters for extended service, filter housings, and updates for obsoleted items. We are in the process of revising our filter packages to provide additional savings. If you are looking for something and can’t find it, please don’t hesitate to ask us. We strive to make your job easier by providing the best service in the industry. Orders can be placed by phone (toll-free), fax, or email. Most orders received by noon (central time) are shipped the same day. Existing customers with one location only need to give us a purchase order number and the items desired. If you have multiple locations, we would just want to be sure that the addresses are correct. If your needs are consistent, we can set up regular shipments as desired. Prices would be locked in for a mutually agreed term and the filters would keep coming regularly until you tell us otherwise. Just tell us what you want and we will do our best to accommodate you.